How Becky Hammon, Ground-breaking NBA basketball Assistant Coach, Can Inspire Writers, too! I started attending women’s basketball games at Colorado State University more than two decades ago. Early on in the 95-96 season, I remember saying, “Where’s that little girl? We need her on the court.” That little girl was 5’6″ Becky Hammon, who was recently named the first full-time female assistant coach for an NBA team. Today is the first day of the Women’s Fiction Writers Association Women’s Fiction Week 2014 workshop. It features presentations from many names in women’s fiction. While reading through the introductory messages from other participants, I found myself getting depressed. They were almost all published or had novels circulating with requests to read. While at the opening luncheon for the 2014-15 season of CSU Ram’s basketball yesterday, another fan alerted me to a recent video with Robin Roberts interviewing Becky. It was just what I needed. Advice to young girls: bring passion to everything you do. Have an excitement and enthusiasm to your work and work as hard as you can. The take away? Becky is on the short side, from South Dakota. 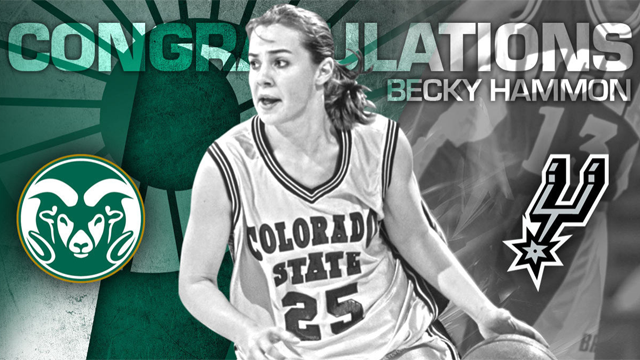 She was under recruited to college, which is why Colorado State was able to snag her. She did have a great teammate in Katie Cronin. Probably both of them helped and encouraged each other to be better. I suspect Katie, along with Becky’s family, was a big supporter of her progress when she–again–wasn’t recruited out of college into the fledgling WNBA. I was at another pre-season basketball picnic before Becky’s junior year. She was walking around and introducing herself to the fans, saying, “Hi, I’m Becky Hammon.” It was funny because, of course, we all knew who she was. To the list of qualities she listed for young girls to strive for, I would add humility. Also obvious in the video, but not something she mentions directly, is the support and belief from others who are important to you. In this case, her family always showed support. Her parents made the drive from Rapid City to Fort Collins for all her games, and although I’m no longer in touch with either Becky or her family, I’m sure they continue to show her support. Actually, I did talk to another one of her former teammates at that luncheon yesterday and she mentioned that Katie and another teammate where making a video to send to Becky. She also said all the teammates sent words of congratulations and support as well. Now after watching her inspiring video, I need to tackle that workshop again and look at it as an opportunity to get better so that I, too, can be one of those published writers one day. Is there a sports figure or someone from another field of endeavor who has words to inspire you?